Make sure to watch the official Wii U trailer at the bottom! Gamers who love their stealth shooters will be happy to hear that some Splinter Cell Blacklist Wii U details have been revealed over the last few days. Anyone who's a of that GamePad controller will be using it like a secondary set of eyes, utilizing it to command various gadgets, as well as to do other actions with both the touchscreen and motion control features. 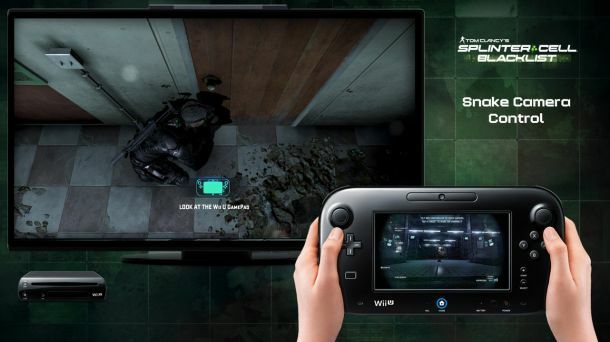 -Splinter Cell Blacklist offers enhanced gameplay options on the Wii U. The Gamepad mimics Sam's OpSat, allowing the player to operate gadgets such as tri-rotor drones, sticky cam and much more through touch and motion based inputs. -The Wii U GamePad allows for faster reaction times, letting the player mark and execute enemies, switch weapons and choose gadgets to adapt to any situation. -Track your friends' missions and see what Splinter Cell Blacklist players are doing worldwide through the GamePad. Not only will players be able to use the GamePad to control multiple pieces of equipment to strategically take down their enemies, but also to track their friends online to view their in-game progress and more. Any further co-op information on these features have still yet to be revealed, but a recent tweet from Ubisoft points towards the co-op aspects of Blacklist specifically, stated to be announced in the near future. Splinter Cell Blacklist will release in the United States this August 20th for the Wii U,Xbox 360, and PS3, and be sure to check out the official Wii U version trailer below.